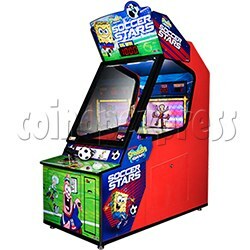 SpongeBob Soccer Stars Arcade Ticket Redemption Game Machine is Andamiro's third amusement machine title adapted from Nickelodeon's hit animated TV series SpongeBob SquarePants. This new single player game incorporates the same lever-driven ball launching system as is used in Andamiro's Baseball Pro series. The apparatus was inspired by the mechanical pitch-and-bat arcade games popular in the 1950s. Nickelodeon-approved voices complement the sound package, and the iconic SpongeBob SquarePants theme is carried through in the colorful cabinet design. Gameplay is simple, intuitive and designed to appeal to all ages. The player is invited to assume the role of Nickelodeon's incurably optimistic sea sponge, SpongeBob. Players must simply pull the lever all the way and have to wait for the ball to come out. The lever must be released in order for players to shoot past Squidward and win lots tickets. The object of the game is to score as many goals as possible in a given time. Players who score 15 goals win the big bonus. A scoreboard displays goals, time and tickets won; a second display on the play field keeps track of bonus data.